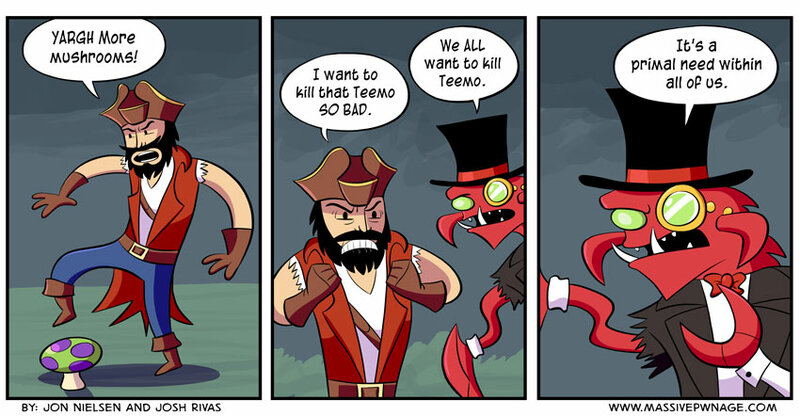 Like all of our other League of Legends comics, Locke came up with the idea for this one. This entry was posted on Friday, September 21st, 2012 at 12:00 am and is filed under Comics. You can follow any responses to this entry through the RSS 2.0 feed. Both comments and pings are currently closed. I don’t get why everyone’s hatin’ on Teemo. Fizz is far more annoying. mushrooms build rage within people. When rage reaches peak, enraged champions will drop current activity and charge teemo on sight, allowing for easier ganks to teemo’s team since he can use this to fish out the more enraged players. It’s a horrible and inhuman tactic, only a yordle can utilize. Teemo has a secret hidden passive that is well known. It is a global taunt that even affects the players playing the game. Its true! Have you ever noticed how when you’re chasing the enemy team, you go through all the mushrooms, but when the enemy team is chasing you, they go around all the mushrooms?